I was inspired by 2 things, the decay of time, and a quote (from Star Trek) as to where time is a predator - I wanted to convey those concepts. Constructed out of 18 gage copper and brass sheet metal all pierced, cut, textured, riveted, and patinated by moi - each gear is unique and lovingly crafted and filed to its final organic shape. 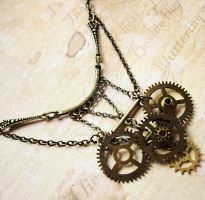 It is a beautiful necklace with a nice short chain to sit high on your chest to make a statement - very steampunk chic. It reminds me of a sea plant a little. It is very beautiful and wonderfully crafted! I am amazed by the work! ....I'd like to say it gives me the impression of a map of a continent, that's slowly fading away with time. This is amazing! I like your theme. O I love it! Makes me think of a coral reef. Love your technique, carefully constructed chaos. Reminds me of the Antikythera mechanism. For me it is hard to fine Steampunk jewelry that puts a new spin on an old look. I think this is great the idea and I particularly appreciate the patina work. I love a great patina and enjoy fiddling with chemicals and application techniques on my lamps. This is a great piece of jewelry. Bravo! Wow... Love this. How big is it? I'm imagining around three inches wide. very beautiful. Love how the shapes come together. Fantastic mate! If that's what you made in intro to metals class, I can't wait to see what else you come up with. Beautiful. If you don't mind my asking, do you solder the pieces together or glue them and do you put resin on them? I'm think of getting into this sort of thing. time is a predator, stalking us all our lives... I prefer to think of time as a companion. excellent depiction of your ideas. turning a concept of entropic time to something beautiful and tragic all at once. Not easy to do in a jewelry medium I know, I've tried! This is wonderful and the fact that you made all of it, is amazing. STUNNING! Ah! Something different at last. I absolutely love the upper, unraveling gear. Congrats on a wonderful piece! This is really a beautiful piece. The shapes, texture and patina work perfectly together. Nice job! The gear shapes and the chaotic shapes all work together nicely. Beautifully dramatic. I love the way you made the clasp. You represent your inspiration very well. Interesting surface details you've managed to get. Did you use a hammer for the initial textures? In a word; Beautiful. It makes me wonder. Feel like we forgot something long ago. Or buried it deep to hide it away.
. . . D: Steampunk. . .
this is the best of all steampunk art i have ever see, is just amazing ....!!!!!!!!!!!!! Star Trek FTW! Also, this piece is fantastically done. This is awesome, really really fantastic. Love the entire feel of this, you really got what you were going for. I really like this, though I'm probably too old to wear it - I'd have it on my wall though!